Located in Bangor, Michigan, the Freestone Pickle Company has been providing our loyal customers with the finest pickles and related products for six generations – over 113 years to be exact. With experience like that, it’s safe to say that pickle juice runs in our blood. We’re proud of our family company and the high quality of the products we offer. Those pickle cars in our logo actually existed – in fact, they were our primary means of shipping our product out of Bangor for a number of years. In 1903, three men—William Freestone, W.D. Freestone, and George Larkworthy—had the dream of beginning a family-run pickle company. On January 23rd of that year, the Freestone Pickle Company was incorporated under the laws of the State of Michigan with a charter for manufacturing of pickles, vinegar and kindred lines. The principal office was located in Benton Harbor, MI, with plants in that city as well as in Bangor, and several receiving stations located throughout southwestern Michigan. By 1911, all activities of the company were consolidated in Bangor, MI. As the original founding fathers passed away and the next generation stepped into their shoes, the company went through several name changes—first, “W.D. Freestone & H.W. 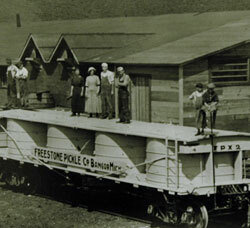 Freestone, Co-partners” after William Freestone’s passing in 1938, and then the “H.W. Freestone Company” following the passing of W.D. Freestone. Although the name changed, the company remained in the Freestone family, and Rex and W. Donald Freestone H.W.’s brother and son, came on board. At that time the plant consisted of an 18,000 bushel tanking yard, a processing and bottling room, and a two-story building for the storage of supplies and finished product. Distribution was limited to Michigan, Illinois and Indiana. The company operated as the H.W. Freestone Company from 1947 until 1991, when the company was reincorporated as the Freestone Pickle Company, Inc. The incorporating officers were W. Donald Freestone, President; Michael R. Hescott, Vice President; Rose Marie Freestone, Treasurer; and Jennifer M. Hescott, Secretary. These officers represent the fourth and fifth generations of the Freestone family involved in the production of quality pickle products. Today, the Freestones invite you to savor the taste of their pickles and related products, crafted by one of the oldest family-run pickle producers in the country. From our family to yours…enjoy!!! Pickle juice really does run in our veins. Since 1903, the Freestone Pickle Company has produced the finest in pickles and related pickled goods. We presently make our full line of choice products with pride in Bangor, MI, at one of the original company locations. With a 50,000 square foot manufacturing plant employing over 30 people, the company manufactures over 90 wholesale and commercial pickle and pepper items. 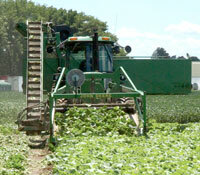 From our 18,000-bushel capacity in the 1930’s, our pickle tanking capacity has grown to approximately 350,000 bushels. That’s over 17 million pounds of pickles! Our products are distributed through over 225 different companies in 35 states. We pack them in 128 ounce jars as well as 5 gallon pails. One of our specialties is individually-packaged pickles, jars, as well as, five gallon pails for home or retail use. We’re pretty picky about where we get our product to pickle. We still follow the secret family recipes that we utilized to make Freestone Pickles over 100 years ago, and our thousands of loyal pickle-lovers wouldn’t have it any other way. While we’re happy to use technological advances to be efficient and enhance the precision of our pickling processes, we believe in doing things the old-fashioned way. We receive our cucumbers fresh from the fields, and begin to process them immediately to lock in the “Freestone-fresh” flavor. 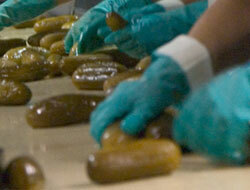 The first thing we do is to inspect the pickles according to our long history of strict quality control. We then sort them by size, or “grade” them, so we’re sure we have just the size you’re looking for, from Large to Super Jumbo. 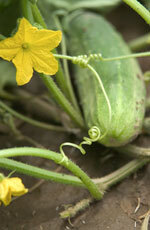 Only the best, most tempting cucumbers are selected to go to the curing tanks. The cucumbers will soak in a salty brine solution in the tanks for as long as three months, slowly transforming into perfectly cured Freestone Pickles. After they’re processed, we inspect the pickles again before they’re packaged to ensure that you receive the best, tastiest product possible. Secret family brine formulations are added during packaging. These recipes give our products their distinct Freestone flavor. Like our Kosher Garlic, Hot, Dill and Sour or our new Chili Lime Pickles—with their through-and-through flavor. Our methods may be time-consuming, but we know that the care we take in making our products comes through in their fresh, rich flavor. And, we know that Grandpa Freestone wouldn’t have it any other way!